There was a Church erected on this site over a thousand years ago, parts of which are incorporated in the present structure. The original Church was a small Saxon one of nave and chancel only. 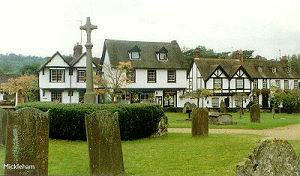 It is mentioned in the Domesday Book (1080 -1086) which states: "There is a Church and two acres of meadow". There are still traces of this ancient building and if the visitor, after entering, will look up behind then they will see something of this Saxon work, which probably goes back as far as the year 950. In the interregnum between the two Viking invasions, when Edgar was on the throne (959 - 975), quite a few Churches were built in the villages of England and it is likely that St. Michael's was one of them. 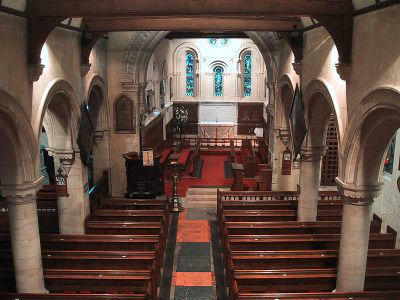 It is known that before the so-called "improvement and re-construction" of 1842, our Church bore many evidences of great antiquity and the architect at that time, F P Robinson, produced a folio volume entitled "An Attempt to Ascertain the Age Of Mickleham Church", published by Carpenter, of Bond Street. Fully illustrated by plans and drawings, it entered into an elaborate comparison with other churches in England and Normandy that show exactly similar styles. Some of the earliest comparative specimens are those of the capitals and arches in an old convent Church at Ely, the date of which is assigned to Edgar (958-975). Another of early dates is a capital in the Chapter House of Oxford Cathedral, said to have been built by King Ethelred in 1004. Other examples are given of pure Norman character down to 1070. In taking down the old West end of the Nave at Mickleham, which formed a casing against the tower, the old plaster coating was discovered with the date 1080 marked on it in red colour. Yet the Church as we have it today dates for a large part from the Norman period, somewhere about 1180. It will be seen that the chancel is out of alignment with the nave. This appears to be an example (common to a number of ancient churches) of what has been termed the 'Weeping Chancel', being an attempt in a cruciform building to suggest the inclined head of Our Lord as He hung upon the Cross. The entrance into the chancel is under a fine but simply ornamented Norman arch "with double Chevron bead and dog tooth" exactly similar to the one at Caen in Normandy, the manorial Church of William the Conqueror, one of whose nephews was granted the manorial estates that contained Mickleham. It was raised to its present height in 1872. The lancet windows, North and South, in the chancel are the original ones of the twelfth century. The font, whose basin is made from a single stone, is another fine Norman relic. The small window at the west end of the south aisle was probably a leper's squint at one time. The old 12th century arches were replaced by new piers and higher arches in 1823 whilst the North aisle was added in 1872 with the original north wall and ancient doorway being replaced in the process. The beautiful 14th century three light east window and another on the south wall were also removed. The galleries were taken out and piers replaced by pillars with the north aisle being dismantled in 1891. In fact it was whilst the 1823 repairs were being effected that as the ground around the North door was lowered so two ancient tombstones were revealed. They date from about 1330 and now are positioned either side of the entrance porch. Among the most interesting and ancient parts of the Church is the side Chapel, now known as the Norbury Chapel. With its chequered flint and stone walls it goes back to about 1300; some of this work may be seen from the North aisle over the modern archway, being part of the old outside wall. The Chapel contains an ornamented stone tomb, that of "Wyllyam Wyddowsoun, Citizen and Mercer of London ... and also Jone his wife". Their brasses are above the tomb and the date given is "XXVII day of Septebyr, the fifth year of King Hary the 8th" that is 1514. The Chapel later passed to the Stydolf family. Until 1967 the helmet and banner of Sir Francis Stydolf (died 1655) hung in the chancel, but at this time the helmet was stolen and the banner badly defaced. In due course the chapel became the family pew of the Locks of Norbury, whose names are recorded on the marble tablet. The pattern of the ample fire-place, which the pew contained, can still be traced. The old oak panelling comes from St. Paul's School, London and is said to have been part of what was rescued in the Great Fire of London, 1666. The present pulpit is of interest with the panels and carved figures, evidencing superb Flemish craftsmanship, being brought over from Belgium in 1840. Also erected on each side of the altar are some very finely worked and valuable carved plaques, brought over from Bohemia whilst the present reredos was installed in 1938. The four larger Church bells, completing the peal of six were given by Dame Elizabeth Lawrence in memory of her husband, Sir James Lawrence, in 1913. No doubt from the antiquarian's point of view the history of Mickleham Church is one of tragic "restorations", especially when one considers the 12th century Norman arches and pillars that once lined the nave, being substituted for "modern" ones in 1823. Perhaps their condition at that time made it imperative - who knows? It is fortunate however, that so much remains in this lovely building to tell the story of the past. Meanwhile those Christians who live in Mickleham and Westhumble today are concerned with the story of the future and we are striving to maintain this building and the Churchyard, with all its historic pedigree and heritage for generations to come. Do please come and visit us and share the beauty of our Church.